Kiev is the caipital an the lairgest ceety o Ukraine, locatit in the north central pairt o the kintra on the Dnieper River. Kiev is an important industrial, scienteefic, educational an cultural centre o Eastren Europe. It is hame tae mony hie-tech industries, heichher education institutions an warld-famous historical laundmerks. 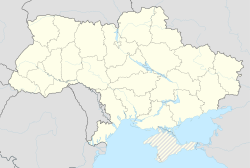 The ceety haes an extensive infrastructure an heichlie developed seestem o public transport, includin the Kiev Metro. Kiev wis clessifee'd as a Beta global ceety as o 2004. The name Kiev is said tae derive frae the name o Kyi, ane o fower legendary foonders o the ceety (brithers Kyi, Shchek, Khoryv, an sister Lybid). Durin its history, Kiev, ane o the auldest ceeties in Eastren Europe, passed throu several stages o great prominence an relative obscurity. The ceety mey hae been foondit in the 5t century as a tradin post, perhaps pairt o the land o the early Slavs. It gradually acquired eminence as the centre o the East Slavic civilization, becomin in the tent tae twalt centuries a poleetical an cultural caipital o Rus', a medieval East Slavic state. Completely destroyed durin the Mongol invasion in 1240, the ceety lost maist o its influence for the centuries tae come. It wis a provincial caipital o marginal importance in the ootskirts o the territories controlled bi its pouerful neighbours; first the Grand Duchy o Lithuanie, follaed bi Poland an Roushie. The ceety prospered again durin the Roushie Empire's industrial revolution in the late 19t century. Efter the turbulent period follaein the Roushie Revolution o 1917, frae 1921 onwards Kiev wis an important ceety o the Ukrainian Soviet Socialist Republic, an, frae 1934, its caipital. Durin Warld War II, the ceety again suffered significant damage, but quickly recovered in the post-war years remainin the third lairgest ceety o the Soviet Union. Follaein the collapse o the Soviet Union an the Ukrainian unthirldom o 1991, Kiev remained the caipital o Ukraine. Kiev Peninsula in Graham Land, Antarctica is named efter the ceety o Kiev. ↑ "Leipzig – International Relations". © 2009 Leipzig City Council, Office for European and International Affairs. Retrieved 2009-07-17. ↑ "Ankara Metropolitan Municipality: Sister Cities of Ankara". © 2007 Ankara Büyükşehir Belediyesi – Tüm Hakları Saklıdır. Kullanım Koşulları & Gizlilik. Retrieved 2008-12-08. ↑ "The main directions of foreign relations of the executive authorities of Baku". Retrieved 2007-07-15. ↑ (in Roushie) "Executive Power of the Baku City". Azerbaijan.az. Retrieved 2008-04-08. ↑ "International Cooperation". Official website. Retrieved 2007-07-10. ↑ "Beograd: Međunarodni odnosi". Stalna konferencija gradova i opština Srbije. Archived frae the oreeginal on 2007-09-27. Retrieved 2007-06-18. ↑ "Bratislava City – Twin Towns". © 2003–2009 Bratislava-City.sk. Retrieved 2009-07-07. ↑ "Sister City – Budapest". Official website of New York City. Retrieved 2008-05-14. ↑ "Sister cities of Budapest" (in Hungarian). Official Website of Budapest. Retrieved 2008-01-31. ↑ "Who knows less about Budapest? A quiz with mayor candidates" (in Hungarian). Index. Retrieved 2008-01-31. ↑ "Les pactes d'amitié et de coopération". Mairie de Paris. Retrieved 2007-10-14. ↑ "International relations : special partners". Mairie de Paris. Retrieved 2007-10-14. Wikimedia Commons haes media relatit tae Kiev.